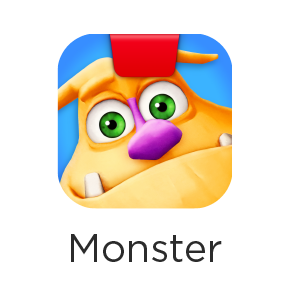 Can I replay levels in Osmo Monster? If you go into the gallery in Monster, you will see two buttons below every old show. The Replay button (which looks like a VCR play button) plays the show back, without asking for drawings. The Redraw button (which looks like a pencil) makes a copy of the show and asks for new drawings. If you just press the Play button on the main menu, Mo makes a new random show.